You are here: Home / Creationism / Answers in Genesis / NH Notes: A Four-legged Snake – Has the Edenic Serpent been Found? NH Notes: A Four-legged Snake – Has the Edenic Serpent been Found? An exquisitely preserved fossil snake has made its debut on the internet the last couple of days and it’s getting a lot of attention. Why? Because it has four well-developed legs. No snake fossil has ever been found with four legs. There are a few with two hind legs but none with front legs. The implications are pretty obvious with respect to the origins of snakes which have long been suspected as being derived from lizards but I thought I would just spend a couple of minutes providing a few more details than you might have gotten from the basic science news blurb. I have obtained and read the original research article from the journal Science. One of my first questions was: how certain are the paleontologists that this is, in fact, a fossil of a snake and not just an elongated lizard? The article details many anatomical features including the braincase, tooth orientation, jaw hinge, ribs and tail and conclude that this animal was much more similar to a snake than a lizard. There are legless lizards and lizards with legs as small as this fossil snake but in those cases all of the other anatomical features of the animal tell us that they are lizards and not snakes. So this is a snake with four legs. But these legs are not the type of legs that is going to allow it to run around on all fours. The legs are small and have elongated curved finger bones suggesting grasping ability or possibly aiding in digging. But there is no doubt these are fully formed legs with all the bones of any other footed animal. How is the age of the fossil significant? The age of the rock formation in which the snake was found preserved had been determined in other studies unrelated to this fossil. Hence the age applied to this fossil is not one that the researchers had any control over. But the age turns out to be very significant because to date this is the oldest definitive snake fossil ever found beating out the previous record holder by a few million years. Paleontologists have long-expected that if snakes had evolved from a lizard and they had gained their snake-like features before losing their legs that we would find fossils of this transitional stake between lizard and fully legless snake. 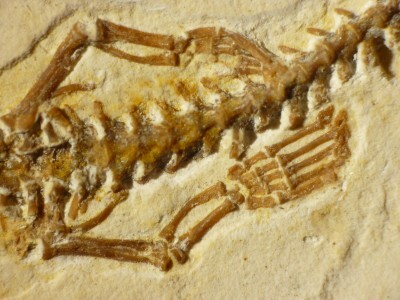 This fossil not only represents exactly that predicted transition fossil but also is found in rock dated to a time in which this transition would have occurred. Imagine for a moment if this snake had been found in 10 million year old rock rather than 120 million year old rock. That four-legged snake would be very difficult to explain in an evolutionary context as it would require a lineage of four-legged snakes surviving for 100 million years but never leaving any fossil remnants behind until just 10 million years ago though there are a few old fossil snakes with back legs. Soft tissue preservation? The press blurbs mention soft tissue preservation which gets a lot of people excited. But it isn’t nearly as exciting as it sounds. Just like many reports of soft tissue, this doesn’t mean that squishy cells are preserved or that even large pieces of soft tissues have been modified for preservation. “Soft tissue” is a catchy term because it garners interest but it is an ill-defined term. Scientists are not afraid of soft tissue preservation contrary to the claims of many creationists but in this case the soft tissues are nothing like what you may be expecting. The soft tissues preserved are simply the evidence of where soft tissues were. Impression of scales, impressions of the basic body and possibly some information about internal organs via impressions produced. The only mention in the text of original research paper to soft tissues is in this sentence: As is typical of Crato vertebrates, the skeleton is articulated and the bones are a translucent orange-brown color; soft tissues are also preserved. In the figure legends there is an indication of where gut contents are and other scale impressions though the authors have stated in interviews that impressions of the trachea are also preserved. The point is that they did not find the actual tissues intact but only impressions of soft tissues. Proof of the Edenic Serpent? Now let’s have a bit of fun with this fossil. I will put on my creation science hat and speculate wildly. I say speculate but I won’t be surprised if Brian Thomas at ICR or Elizabeth Mitchell at Answers in Genesis don’t provide their own unique interpretations of this fossil in the near future. I can already see their Facebook page comments section lighting up with people claiming that this fossil is confirmation of walking snakes in the Garden in Eden. They may claim that the Bible teaches that snakes once walked on legs but were banished to eat the dust of the Earth. Of course, it requires some serious extrapolation to say that the curse on a singular animal should affect all snakes. Was Eve’s serpent a “representative” serpent of all snakes in the creation? When that one serpent was cursed was that curse then transferred to all snakes? Besides, one would have to ignore the geological context of this fossil. If this snake where evidence that snakes once walked on all fours but then they were cursed to slide on the ground then how could this legged snake have been preserved in a global flood that took placed thousands of years after that curse? So, maybe the curse on snake simply started the process of losing their legs. Sort of like Adam and Eve dying in the day they disobeyed but interpreting their lack of death as the starting point of their decay and ultimate death. Snakes starting to lose their legs would be the genetic entropy argument that creationists like to use to explain why some animals have lost abilities, like flight, over time. PS. There is controversy surrounding this fossil. It was identified from a collection of fossils kept in Germany but clearly came from Brazil but no one knows how it got to Germany or when. It appears it was probably part of an illegal fossil trade but no one is doubting the veracity of the fossils authenticity as having four real legs. There are some scientists who think it is possible this is neither snake or a lizard but an unrelated animal but it seems more likely that the mixture of characters is what one would find in animals that are transitioning from lizards to snakes. You are perhaps thinking of something like this article from 2010 (I saw a different YEC article recently which said much the same thing but I can’t recall exactly who said it or where the comment/article appeared)? Impressive! I love it when new transitional forms are found, exactly where and when they were predicted to be, even though we didn’t have them yet. It frustrates me that my dad, an ICR devotee (and I mean cultish devotee) refuses to be intellectually honest about evaluating or even considering/looking at any of the real evidence – he’s been spoon fed indoctrination by ICR for so long that he believes everything that evolution and science comes up with as more proof is just twisted facts (dating methods are just circular reasoning!) to support their ‘lie’ of an old and evolving earth. So hypocritical, when it’s ICR that is doing that exact thing. Ooohhh… very interesting indeed. Thank you Joel for this post. Thanks (as always) for the good information. Maybe this is a decent thread for my question: how are structures identified as homologous? Since these snake legs look like legs & seem to have the function of legs, this case appears pretty clear-cut. But in cases where the structures have entirely different functions or look significantly different (I’m thinking leg/pelvic structures in whales & snakes, for example), how do we conclude that they’re homologous (rather than unrelated) without it becoming a circular argument? The internet has helped me find tons of examples, but not an explanation of how the less-obvious ones were classified that way.